Szczecin is the capital and largest city of the West Pomeranian Voivodeship in Poland. Located near the Baltic Sea and the German border, it is a major seaport and Poland's seventh-largest city. The city's recorded history began in the 8th century as a Slavic Pomeranian stronghold, built at the site of the Ducal castle. After the Treaty of Stettin in 1630, the town came under the control of the Swedish Empire. It was fortified and remained a Swedish-controlled fortress until 1720, when it was acquired by the Kingdom of Prussia and became the capital of the Province of Pomerania, which after 1870 was part of the German Empire. Ivan Lendl was the tennis equivalent of MSD those days – cool, composed, strategic, confident, strong ~ and comparisons stop at some point, for he was never able to win a Wimbledon. Michael Chang is in the record books as the youngest winner of a grand slam but his French Open triumph in 1989 is largely remembered for one extraordinary moment in a last 16 match against Ivan Lendl. At Szczecin, a cheeky tennis player pulled off what is being described as the best serve (!) of all time after bamboozling his opponent with speed and sleight of hand. 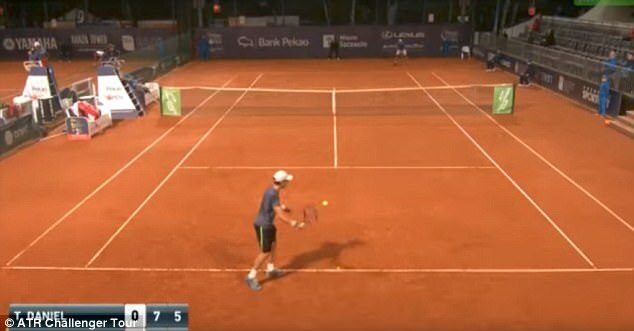 Argentina's Renzo Olivo, ranked outside the world's top 100, was taking on Japan's Taro Daniel in a pro tour match when he sprang his sudden underhand move. Playing on a clay court in Szczecin, Poland, Olivo, 25, stood on the baseline preparing to serve in the traditional overhand motion before quickly tapping the ball over the net using an underhand serve - catching Daniel and the audience off guard. The unexpected shot drifted over the net gently leaving opponent Daniel stood frozen on his baseline unable o react in time. Despite Olivo's quick thinking, it wasn't enough to overcome Daniel, who won the match in straight sets, 7-5, 7-5. The 25 second clip has since gone viral with more than 100,000 views in under two days. As is with many games, 'Tennis runs in cycles. There are victories. There are disappointments. ~ there are victories gotten over not so right means too ! On that forgettable day, trailing 15-30 on his own service, the writing was on the wall when Chang decided on an unconventional approach, which was to decide the outcome of the match. We still remember that infamous incident in Cricket field in which our former Cricket coach was involved. Controversy is his middle name – he scored 7110 runs in Tests and 2331 in 74 One dayers – he blabbered on Indian culture too ! Gregory Stephen Chappell was quoted as saying that ‘ Indian side lacked leaders because parents, school teachers and coaches made all decisions in the Indian system’. The biggest mistake India ever did was appointing him the Coach of the National Team on a 2 year contract in 2005. What the highly paid coach brought was chaos, sectionism, bias and hurting the Senior cricketers including Sourav, Sachin and others. India had their worst performance under his tenure in 2007 World Cup and fortunately he quit in Apr 2007. The Cricketing fraternity will never forget nor forgive his ‘stinking under-arm’. It was on 1st Feb 1981 at Melbourne – match between Australia and New Zealand. Kiwis were chasing 235 – the good knock of Bruce Edgar got them closer – 15 required off the last over – an improbable one those days. This loud mouthed gentleman was at the helm and his younger brother Trevor Chappel was the bowler. Off the last delivery 6 was required to be hit – Brian McKechnie was at the strike. With fear overtaking shame, Trevor under instructions from Greg informed the Umpire of his intention and bowled underarm. That was his strategic move in winning the match.